A hub of financial and state government jobs, Richmond's unemployment rate is among the lowest of all 55 metro areas. As a result, less than 12% of residents live below the poverty line. And even though there are plenty of jobs, work's not too much of a grind for most residents. Workers spend less time getting to work and fewer hours on the job once they're there. 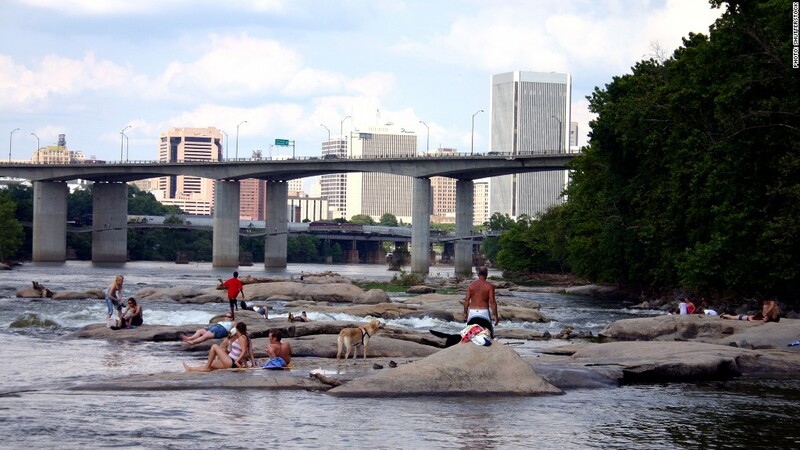 "We've had a lot of people who have moved here from more stressful cities comment on... the light traffic and how their tab at dinner is a lot lower than they're expecting," said Lesley Bruno, marketing director at the Greater Richmond Chamber of Commerce. One downside: residents aren't in the best shape -- thanks to an above-average smoking rate and lower-than-average exercise rate. But the city has been working to change that with the mayor's "Healthy Richmond" campaign, which promotes active lifestyles among residents, Bruno said. There is also a growing cycling community in the city.